When a company’s mail server gets old and its performance is poor even after fine tuning, it is about time for IT staffs to consider replacing the mail server. It is a painstaking process moving all the e-mail accounts along with their e-mail messages from the old one to a new one. EVO staffs have thought about this and would like to give you a hand. On Account tab, click on User Account Tools tab. Notify all users with e-mail accounts to log in with their own username and password within a period of time. When time is up, click Stop button to turn off the capturing. By now, EVO Mail Server should have usernames and passwords of all e-mail accounts in the company. Note: Should any user be unable to log in, make sure the user turn off Encrypted Password and use Plain Password instead. Scroll down to 5. Collaborating with LDAP for account authentication. Click the switch and make it YES. Select between WINDOWS and LINUX in LDAP server type. Enter AD or LDAP server’s IP address in Domain or IP-addr. The LDAP default port is 389. If it is different than 389, enter the port. 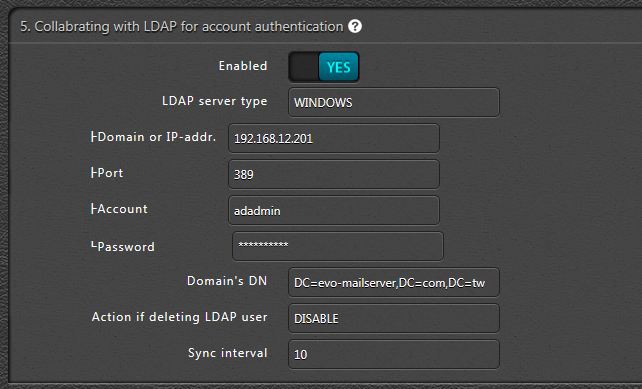 In Account and Password fields, enter AD or LDAP server’s administrator username and password. In Action if deleting LDAP user, you can either select DISABLE or DELETE local user account when that particular user is deleted on AD or LDAP server. In Sync interval, enter a integer value to define time interval that EVO Mail Server synchronizes with AD or LDAP server to update add, disable, delete actions accordingly. Once import is complete, EVO Mail Server is ready to serve. Download EVO Mail Migration (EMM) from EVO’s official website. On Source MailBox side, enter source mail server’s IP or host name, username and password. On Destination MailBox side, enter EVO Mail Server’s IP or host name, username and password. SSL (implicit) – Make the transfer session in SSL connection. Skip mailitems tagged with Spam – Check this to skip spam mails. Skip mailitems larger than – Enter an integer value to define upper boundary to be transferred. Automatically resume if migration aborts – Like FTP, EMM will pick up where it was left out in case transfer session is broken. Skip mailitems older than – Select a date and EMM will skip e-mail messages older than that. During transfer session, transferring progress and status will inform users how far has it gone. Upon completion, log in user account. There will appear a mail folder called EVOMailMigration where all transferred e-mail messages are located with all the folder structures retained. Drag and drop all e-mail messages and folders to appropriate locations in mailbox. Open EVO Mail Server GUI. Click on an e-mail account to open its editing profile. Scroll down to Send tools/Information/notification emails section. Click on Import .eml mail dir. into this account button. Browse to where .eml files are located to proceed import.